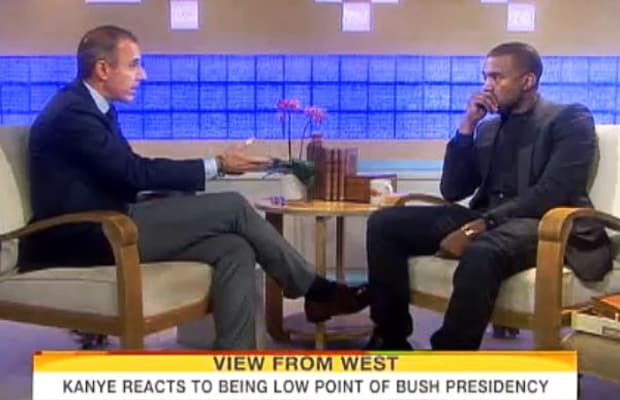 Just prior to the release of My Beautiful Dark Twisted Fantasy in 2010, Kanye hit the Today show to talk with Matt Lauer. This being the Today show, Lauer was less interested in discussing the new album than in stirring up controversy. So he asked Kanye about calling President George W. Bush a racist after Hurricane Katrina and about interrupting Taylor Swift's MTV VMA speech in 2009. Kanye, who described himself as a “rational, well-thought-out, empathetic human being” during their talk, was constantly pushed and prompted during the questioning. First, Lauer playing a clip of Bush talking about how Kanye's accusation made him feel—as if West wouldn't be able to sympathize with the ex-President unless he watched the clip again. “I don't need all the jazz,” West told Lauer. But Matt was just getting started. While Kanye was talking about the Swift incident, Lauer played the MTV Awards clip, interrupting West's train of thought. “Please don't let that happen again,” he ordered the soundmen on set. Well, it won't. That was the last formal interview Kanye has done. (Thanks for nothing Matt!) "If I don't say something in a rap or on Twitter, it's not true," he recently told Us magazine, in passing.